For use with water and oil based paints. Air cap adjustment to produce horizontal or vertical spray. Paint control knob to adjust flow of paint. Setting for over head spraying. Simple trigger action. Inflation nozzles for airbeds and balloons. 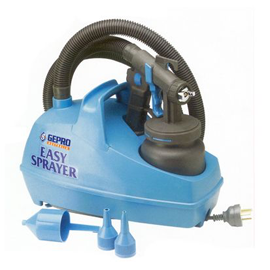 Includes: Spray gun, 3 metre hose, Spare paint pot & lid, Inflation nozzles, and Comprehensive manual.